Apple just concluded a "field trip" of sorts in Chicago, with a large focus on education. 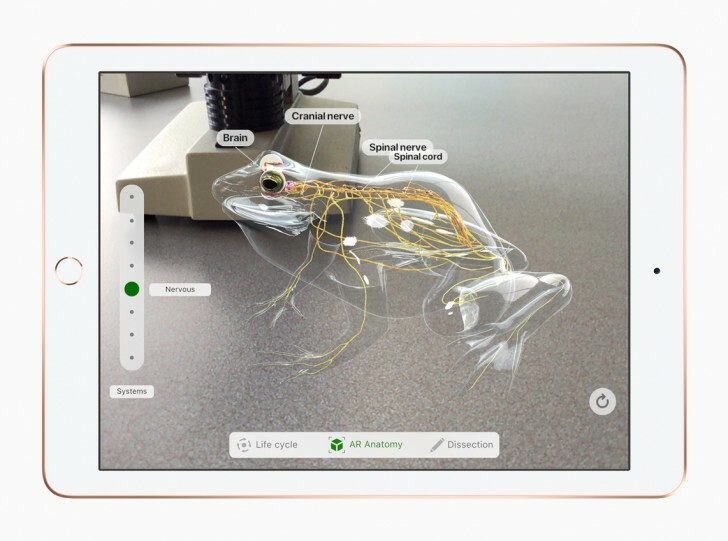 Most announcements revolved around software tools for teachers and students, but, there's also some new hardware to utilize in the classrooms and beyond - a new 9.7-inch iPad. A good way of thinking about it is an upgraded iPad 9.7 (2017). Most notably, one compatible with the Apple pencil and all the interactivity that comes with it. Visually, it is identical to the current iPad, which only makes sense for cost-saving. Hardware-wise, there is likely some change in the display or digitizer to enable the pressure and tilt recognition, while using an Apple pencil. The resolution is unchanged at 1536 x 2048 pixels, though. On the inside the upgrade is Apple's A10 Fusion chipset. It delivers 40% better CPU performance and is 50% better at GPU tasks than the A9 in the previous iPad 9.7. Still, it's not the latest Apple silicon as 2017 iPhones are running on the newer A11 Bionic SoC. The rest of the iPad hardware seems to be unchanged. You still get an 8MP, f/2.4 main camera, HD (1.2MP) Facetime selfie snapper, GPS, compass, gyroscope and accelerometer, all wrapped up in a 470 gram,metal body, measuring 240 x 169.5 x 7.5 mm. An LTE version is available as well. Speaking of extras and tiers, Apple maid a point that this is its most affordable tablet to date. 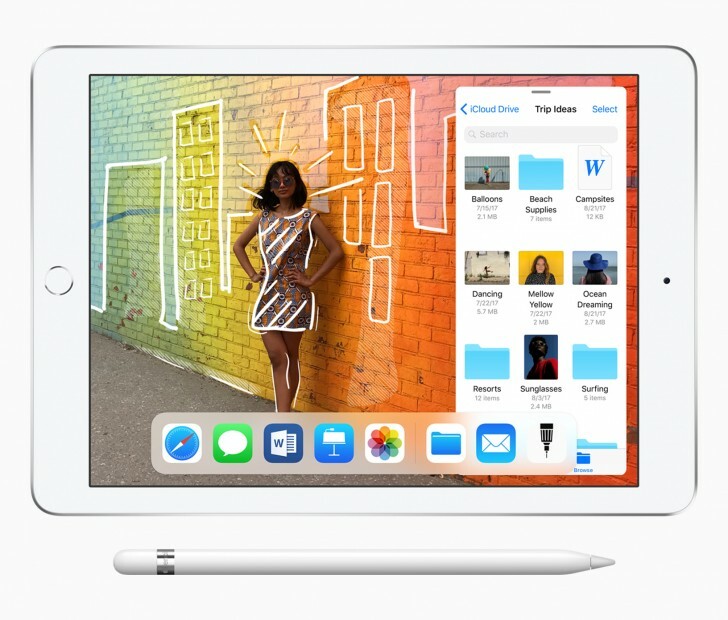 The new iPad will start a $329, for a 32GB Wi-Fi model and $459 for a 32GB + cellular one. The other storage option is 128GB and costs $100 extra. 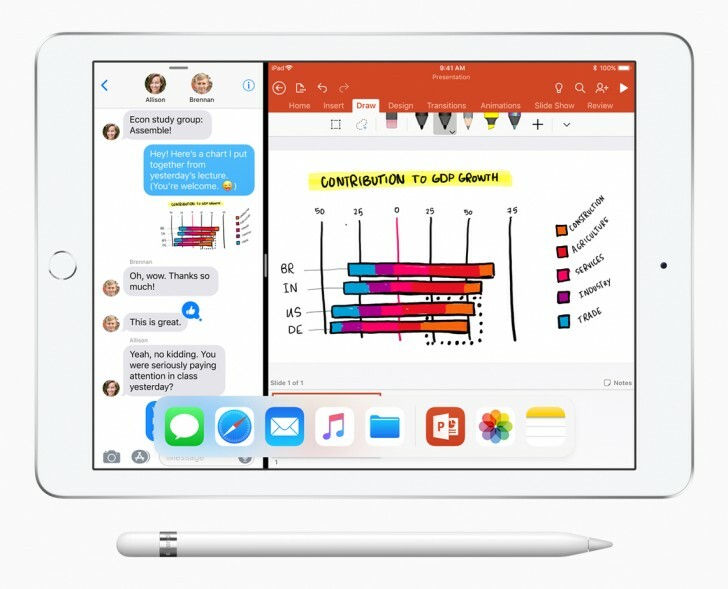 Schools can get a better deal on the tablet - $30 down, so the new iPad will start at $299. Color options include silver, space gray and a new gold finish. There is an educational discount on the Apple Pencil now as well - $89, instead of the usual $99. If that is still a bit too steep for your taste, Apple also showcased a more affordable Logitech Crayon stylus accessory, priced at $49. Just to sweeten the "educational offering" a bit more, Cupertino is also throwing in 200GB of free iCloud storage for students, instead of the standard 5GB. As you can imagine, Apple had a bunch of educational app demos and a couple might just have the potential to accelerate Cupertino's expansion into the heavily Google Chromebook dominated sector. Schoolwork, for instance, is a new cloud-based app that lets you assign handouts and track progress. You can make hand outs with PDFs, links, docs. It looks like sending an email and is just as intuitive. Along with that Apple is launching the ClassKit API, which third-party developers can use to communicate and integrate with Schoolwork. It's a great way to provide some extra flexibility for new and custom features. The Apple iPad 9.7 (2018) is available right now. European customers will have to shell out €349 for it, while the price in the UK is £319. Forget dedications to education and schools, it's still beets any Android tablet by far. It has my interest piqued, and I haven't considered buying another tablet in years (still using a Galaxy Tab S 8.4, mostly for travel).